Mark Zuckerberg (b. Mark Elliot Zuckerberg May 14, 1984) is a web entrepreneur and computer programmer. He is the co-founder of Facebook, a social networking website used by one billion people worldwide. As of April 2013, Mark Zuckerberg is also the Chairman and Chief Executive Officer of Facebook, Inc. His net worth is estimated to be $13 billion. While at Harvard, Zuckerberg and his roommates launched Facebook as a platform for college students to create their own profiles, upload photos, and communicate with other users. The site was first known as The Facebook and was only open to Ivy League students. The group first ran the site out of a dorm room at Harvard, but later moved the location to Palo Alto, California. Mark Zuckerberg, who dropped out of college after his sophomore year, was involved in several legal disputes that were initiated by other Harvard students who claimed that Zuckerberg used their ideas during the development phase of Facebook. 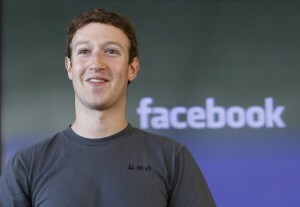 Zuckerberg has been named among the wealthiest and most influential people in the world. The birth and rise of Facebook was portrayed in the 2010 Hollywood film The Social Network. Mark Zuckerberg has donated millions to a variety of philanthropic organizations. Zuckerberg’s interest in computer programming developed at a young age. In middle school he used Atari BASIC to create a messaging program he called “Zucknet.” Mark Zuckerberg later attended a private preparatory school in New Hampshire. While in high school, he created a program similar to today’s music software, Pandora. Several companies, including Microsoft, expressed an interest in acquiring the program, which Zuckerberg called Synapse. He even received several job offers before high school graduation. Zuckerberg declined both because he wanted to pursue college. After high school, Zuckerberg attended Harvard University, where he was known as the go-to programming guy on campus. During that time he wrote a program called CourseMatch, which helped students pick their classes based on other student’s course selections. He also created Facemash, a program that compared pictures of two Harvard students and allowed users to vote on their appearance. The software became increasingly popular, but Zuckerberg was forced to shut it down since the program was considered inappropriate. Soon after, Zuckerberg and his roommates created a platform that allowed Ivy League college students to create their own profiles and communicate with other users. Initially, they called it The Facebook. Zuckerberg dropped out of college after his sophomore year in order to bring his entire attention to Facebook. He also moved the company to California. By the end of the year, Facebook had one million users. In 2012, Facebook had its first public offering which raised $16 billion. The next day, Zuckerberg married his longtime girlfriend, Priscilla Chan. In 2013, Facebook made the Fortune 500 list for the first time—making Mark Zuckerberg, at the age of 28, the youngest CEO on the list.